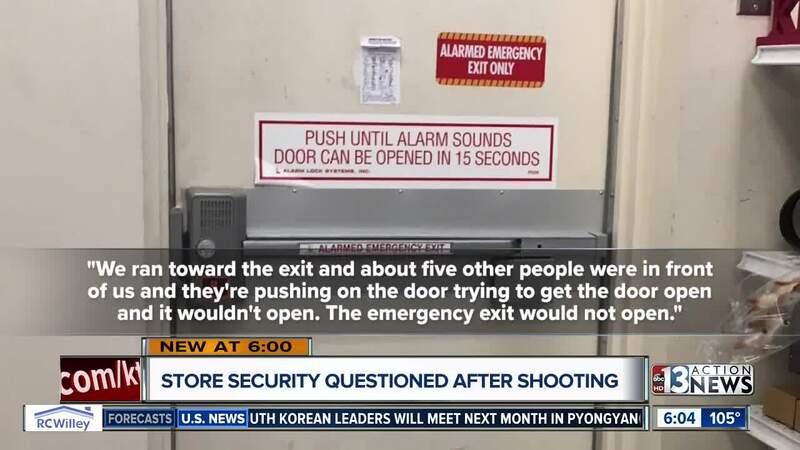 At least one shopper claims she was unable to escape a Ross store after a rear emergency door would not open during a shooting scare Saturday. Las Vegas police say the Ross store near Blue Diamond and Valley View was packed with shoppers when Mohamed Mahmoud, 37, opened fire inside. Shauna, visiting from California, was inside the store with her 7-year-old niece when she tried to escape the terror. "We ran toward the exit and about five other people were in front of us and they're pushing on the door trying to get the door open and it wouldn't open," explained Shauna who did not reveal her last name. Shauna says the shoppers had to move to plan B when the door wouldn't open but quickly ran into more problems. "There was a break room that was back there and we turned, everyone ran into the break room and we tried to pull the door closed, but it was bolted, to the floor, the doorstop was bolted to the floor and it wouldn't close," said Shauna. After several terrifying moments, the danger passed and the shoppers were shaken but unharmed. Contact 13 visited the store Monday to inspect the emergency doors. The emergency exits appeared free of merchandise and other obstructions. Contact 13 observed one of the doors labeled with a sign that read"
A law enforcement source tells Contact 13 the delayed exit is a common loss prevention tactic to deter shoplifters from using the emergency exits as a quick getaway. Clark County released a statement regarding building and exit codes related to emergency exit doors. Our building and fire codes related to emergency exit doors contemplate how they would be used in the event of a fire. The emergency exit doors are locked until the fire alarm or fire sprinklers are activated, at which time the doors would automatically open. The door operates properly as designed. According to Clark County booking records, Mahmoud is facing multiple attempted murder charges and discharging a firearm inside a building. Police say Mahmoud was a disgruntled store security guard who had an argument with two supervisors before the shooting. In Mahmoud's arrest report, one of the supervisors said he was also unable to open the emergency door when he tried to escape. A responding Las Vegas Metropolitan Police officer, now identified as as 47-year-old Bryon Bunitsky, fired at Mahmoud and he was taken to the hospital. Online records show no known previous criminal history for Mahmoud. A court hearing is scheduled for Tuesday.